The Dizzy DJ | The yearmix 2018 and more. De jaarmix 2018 en meer. Hi all. I have a little surprise. I uploaded all mixes. They are available for a week in a wetransferlink. Short mixes, megamixes and yearmixes. 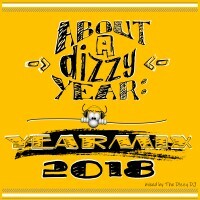 The 19th yearmix: about a dizzy year: YEARMIX 2018. Containing only the best dancetracks from 2018. Starting at 115 BPM and ending 155 bpm. The mix contains 75 tracks and the total playing time is 59 minutes. 14-10-18: The #yearmix2018 intro is allmost ready. This week the #yearmix will start. 5-11-18: Status. 30 tracks, 25 minutes playing time. 24-11-18: Status 56 tracks, 43 minutes. Read more about YEARMIX 2018! Here it is. The All Time Hardtyle Megamix. The All Time Hardtyle Megamix. Based on the Top 100 charts from Hardnews 2017. After 11 years I will spin the wheels of steel again. Here you can buy the tickets. And here it is. The yearmixvideo 2017 is there. Kozmikdj made this one like last years and he did a very fine job!